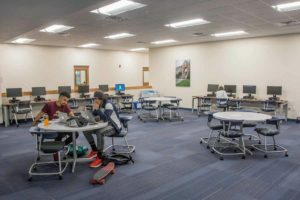 The Hill Freeman Library and Spruill Learning Center has 40+ computer workstations, each with network connectivity and a full suite of application software. Laser printers and scanning equipment are available on site. A wireless network is available throughout the library for laptop and smart phone users. The After Hours Library, which is available to students, faculty and staff 24 hours a day, 7 days a week, 365 days a year, includes computer workstations equipped with a full suite of application software. They are all networked and connected to a laser printer. Read more about the After Hours Library. The library has a limited number of laptop computers available for use within the library and for students to check out overnight. The laptops have a full suite of software and are enabled to print to the library printers. Laptops may be checked out at the library service desk. For more information on the use of the library laptops, please see the Laptop Policy. Remember, you are unable to save files and work to the library computer hard drives. Please save your work to a flash drive or e-mail it to yourself. Remember to save your work often so that in case of a power failure or other computer problem you will not lose all your work.